A scratch card being scratched. Scratch Cards are a bonus feature in Mario & Luigi: Bowser's Inside Story and its 3DS remake. They allow the Mario Bros. or Bowser to get a refund for some of the coins they spent back when shopping. A higher Stache or Horn stat affects the odds of winning. After purchasing something from a shop, the player may be given the option of scratching a scratch card. 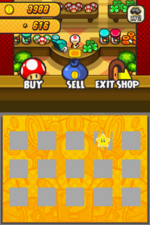 Scratching a Mushroom refunds 10% of coins spent, a Fire Flower refunds 20% of coins spent, and a Super Star refunds 40% of coins spent. However, if the player scratches a Fawful, there is no bonus. This page was last edited on February 13, 2019, at 15:02.